The iTunes Store home page is loaded with specials and ads to peruse. To look at music in more depth, click the Music tab. You can also pick a music genre by clicking the down-arrow button that appears next to the Music tab when your pointer is over the tab. 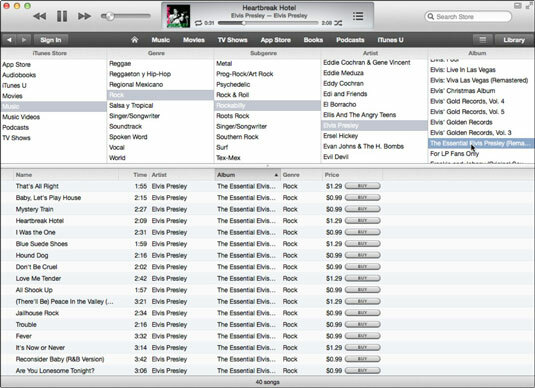 Besides Music and other tabs, the iTunes Store offers other buttons along the top of the iTunes window. The left and right triangle buttons work just like the back and forward buttons of a web browser, moving back a page or forward a page, respectively. The Home page button (a Home icon) takes you to the iTunes Store home page. After you click an album or select an advertisement for an album, the album’s page appears with a description and other links. You can then click the Buy button with the album price or the Buy buttons with song prices for individual songs. Gift This or Add to Wish List: You can e-mail a gift certificate from the iTunes Store for this item to someone, or just put it on your iTunes Store wish list, which you can visit later to buy your choices. Tell a Friend: E-mail a link to this content item. Copy Link: Copy the link to this content item to use in a document, e-mail message, or social media posting. Share On Facebook or Share On Twitter: Share a link to this content item on either Facebook or Twitter. To browse the iTunes Store, choose View→Column Browser→Show Column Browser, or click the Browse link in the Quick Links column on the right side of the iTunes Store home page (Browse doesn’t appear on other pages, just the home page). 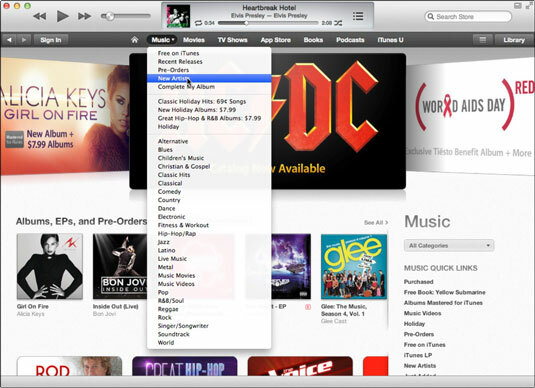 iTunes displays the store’s offerings categorized by type of content (such as Music), and it displays music by genre and subgenre — and within each subgenre, by artist and album. Select a genre in the Genre column, then a subgenre in the Subgenre column, then an artist in the Artist column, and finally an album in the Album column, which takes you to the list of songs from that album that are available to preview or purchase. 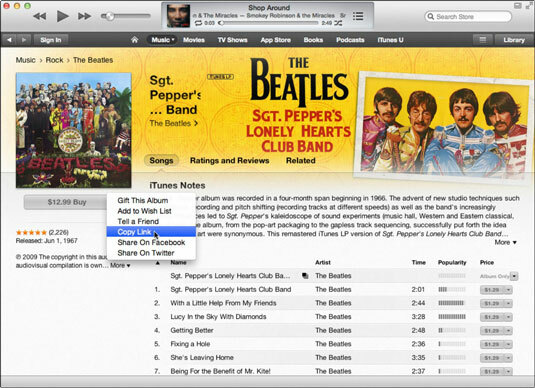 You can play music in your iTunes library while shopping in the iTunes Store. If you know specifically what to search for, type it into the Search Store field in the upper-right corner of the iTunes window; this lets you search the iTunes Store for just about anything. You can type part of a song title or artist name to quickly display suggestions in a drop-down list below the Search Store field — click a suggestion to use it.